matth3wh and deepak like this. For any online shoppers here, we have a special FREE SHIPPING code just for you - add "CoffeeSnobs" into the promotional code section in the checkout to get free shipping on any online orders during the month of the June. We ship from our locations in Newcastle and Brisbane, and ship Australia wide! Sorry, international shipping is not available. Last edited by Crema_Garage; 4th June 2018 at 11:43 AM. Brewster, Casa Espresso and matth3wh like this. We have 2x R58 Rockets that are looking for new homes! To help unite them with the right coffee lovers we are offering the Coffee Snobs community an incredible deal: The R58 $3,700.00 + free shipping. All you have to do is click the link below, add to cart and enter SnobsLoveTheR58 into the promo code section of checkout! Add to cart, along with any other tidbits you'd like. Add in promo code SnobsLoveTheR58.Pay only $3,700 for the R58 and get free shipping from our Newcastle location (only in Australia, we do not ship internationally). ONLY 2 LEFT - so we'd like to see them off to a good home! Any questions, just PM us. clubbi4 and RavenMad like this. The ECM Mechanika V Slim Coffee Machine combines outstanding performance and compact size into one neat little package. Measuring at just 25cm wide, the ECM Mechanika Slim really maximises on small spaces. It saves space by utilising one large 2.2L stainless steel boiler, but being a heat exchange machine it does not compromise on quality or functionality, allowing you to do both coffee and steam at the same time! The new Slim version is a great solution for home users who find they are limited on space for a home coffee setup. -Dimensions (W x D x H hopper included): 152 mm x 159 mm x 324 mm. EOFY Sale - 3 Days Only! For 3 days only we have up to 20% off our alternative brewing range, barista tools and accessories! If you've been pondering about a gooseneck kettle or ruminating on a pour over set up or just need to upgrade some of your barista bits and bobs... NOW IS THE TIME! Hi Coffee Snobs - we have a big question for you. Would anyone be interested if we were to hold an AMA? You can ask us whatever you like and we'll reply within 24 hours. It can be about machines, cafe culture, alternative brewing, or whatever you like! We'd really like to take some time out to get to know this community and for you to get to know us too. arcachon, topshot and scotty595 like this. Fathers Day Sale On - Up To 20% Off Online! Until midnight August 31st, we have up to 20% off a range of brewing equipment, barista accessories and tools. Find the perfect coffee gift for Dad, or grab yourself a deal! We have pickup from our Enoggera and Newcastle stores available, or we do ship Australia wide. Demo model coffee machine for sale! LA MARZOCCO GS3 MECHANICAL PADDLE VERSION - DEMO MODEL FOR SALE - ONLY $8,039.00! Shipping from our Newcastle showroom - only used twice, maybe three times in total. International shipping not available. AMA with Crema Coffee Garage on 25th September! On the 25th September (Sydney Australia time), we will be hosting an AMA! Send us your questions and we will do our best to answer all of them. Who are we? 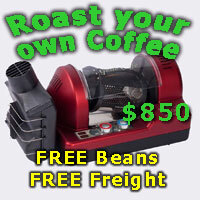 We are an Australian roasting company, cafe consumables and equipment supplier and coffee gear retailer! Our main headquarters is in Newcastle, NSW, but we have a second location in Brisbane, QLD! If you have questions about coffee machines, grinders, coffee beans, roasting, blends, single origins or alternative brewing gear - let us know!